Physical systems that retain no memory of their initial conditions are said to have thermalized, since it is often—but not always—an exchange of heat and energy with another system that causes the memory loss. The opposite case is localization, where information about the initial arrangement sticks around. This situation is more rare, but a prominent example is the Anderson localization of charge carriers near impurities in a conductor. 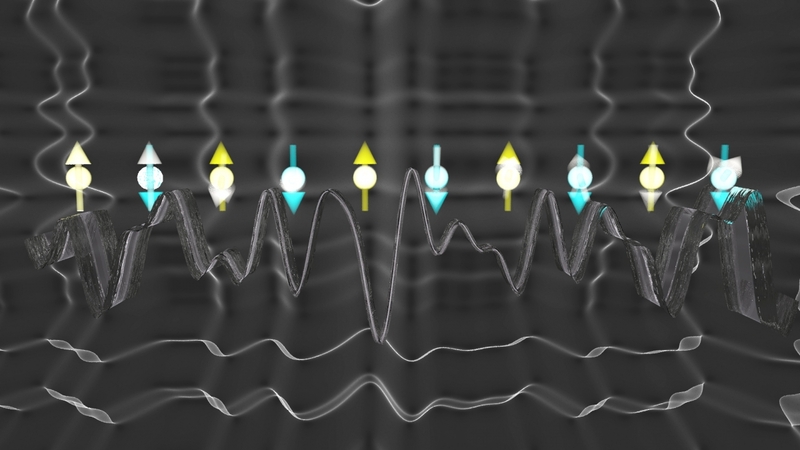 PFC-supported researchers have directly observed the localization of interacting quantum particles, a finding that confirms the ability of a closed quantum system to localize. Researchers searched for signs of localization by introducing disorder into a chain of 10 ytterbium ions. The suspicion was that this disorder would act like the crystal impurities responsible for Anderson localization, preventing information about each ion from dispersing throughout the chain. That information was the initial state of each ion’s spin, which had a local field that favored its pointing up or down as well as interactions with neighboring spins. Lasers controlled the strength and range of the interactions. Additional lasers gave a random shift to the local field of each spin. The team performed many experiments with random amounts of disorder, preparing each spin to point either up or down and then measuring all of the spins after varying amounts of time. Without disorder, the spins rapidly lost any signature of their initial direction. However, as they cranked up the disorder, the spins started to retain information about their initial state. This local memory of the initial condition even persisted through the characteristic time associated with the spin-spin interactions.